As more Filipinos travel around the country, it opens up cultural and leisure opportunities that were not accessible and available to previous generations. Tourism has also provided employment and business opportunities to rural communities which lack a diversified economy. 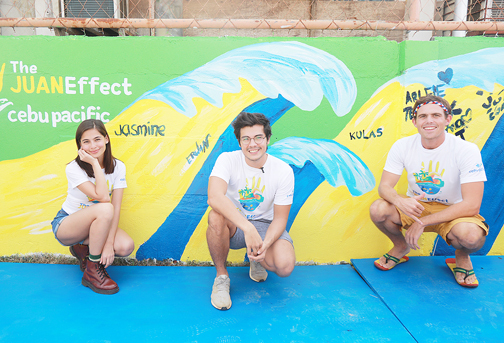 Juan Effect advocates Kyle “Kulas” Jennerman, Jasmine Curtis-Smith, and Erwan Heussaff join Cebu Pacific in engaging locals to practice proper waste management in Siargao. But there is another side to tourism expansion. Natural habitats and ecosystems are affected by the development of roads, hotels, restaurants, and other establishments. Leisure activities such as trekking, climbing and scuba diving also have negative impacts such as littering and damage to coral reefs, flora and even fauna. Leading Philippine carrier Cebu Pacific ramps up its “Juan Effect” sustainable tourism program, particularly in its pilot area of Siargao Island. A partnership with the Department of Tourism (DOT), “Juan Effect” aims to mitigate the impact of tourist arrivals on the environment. Cebu Pacific has been mounting flights in and out of Siargao for the past ten years—the very first airline to do so. Since then, the island has become a popular tourist destination, on top of maintaining its status as a world-class surfing area. Cebu Pacific flies once daily between Manila and Siargao and up to four times a day between Siargao and Cebu using its fleet of ATR 72-600 aircraft, which has the lowest fuel consumption and the lowest environmental footprint in its category. The ATR 72-600 produces 40% less carbon dioxide emissions than other turboprops. And as with all other Cebu Pacific and Cebgo flights, all non-recyclable plastic spoons, forks, stirrers and cups used for inflight meals have been replaced with sustainable alternatives. So far, the implementation of the “Juan Effect” program has resulted in the passage of ordinances in some municipalities in Siargao that pertain to waste reduction and the usage of single-use plastic. To help educate tourists and local residents, colorful murals and signs made of used surfboards have also been put up prior to the peak surfing season that began in September 2018. The airline also commissioned the design and fabrication of receptacles that tourists can use to properly dispose of plastic bottles, which can then be collected to be made into eco bricks or recycled. 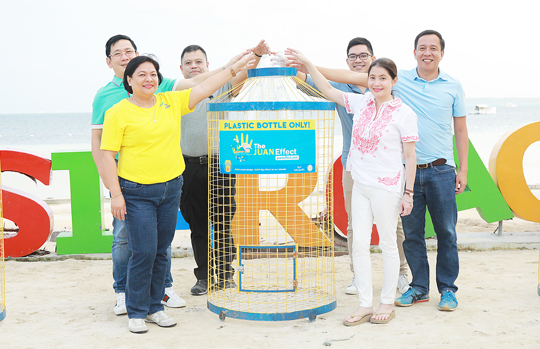 Designed to withstand strong waves and winds, these plastic bottle receptacles will be deployed at key points in Siargao as well as outlying islands to encourage proper waste disposal. Cebu Pacific will also work with local stakeholders to introduce practices to minimize waste in the ground and in the ocean. Engagement activities will be led by “Juan Effect” advocates Erwan Heussaff, Jasmine Curtis-Smith, and Kyle “Kulas” Jennerman. To drum up even more public awareness and support, a colorful mural of the underwater designed by fast-rising visual artist and muralist, Anina Rubio, will be painted on the perimeter wall of the Dapa Elementary School to bring life to the community and inspire everyJuan to contribute towards improving the environment. 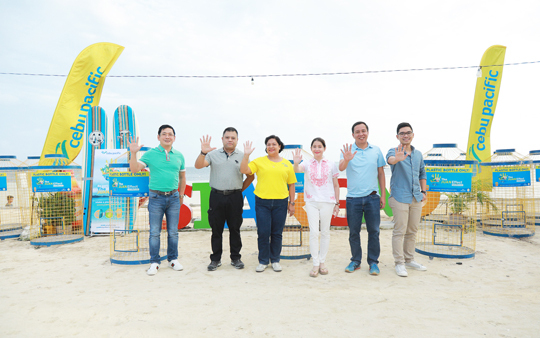 Cebu Pacific Director for Passenger Sales Arlene Tena and DOT Secretary Berna Romulo-Puyat are joined by (from left) DENR Undersecretary for Solid Waste Management and Local Government Unit Concerns Benny Antiporda, Surigao del Norte 1st District Congressman Bingo Matugas II, Surigao del Norte Vice-Governor Hon. Arturo Carlos Egay, and DOT Assistant Secretary for Branding and Marketing Communications Howard Lance Uyking in donating plastic bottle trash bins to Siargao communities to encourage proper waste segregation practices among locals and tourists.